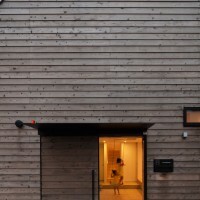 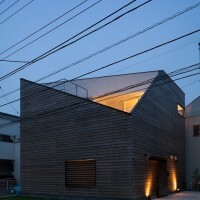 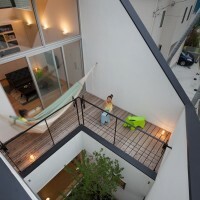 LEVEL Architects have designed a house in Kamakura City, Japan. 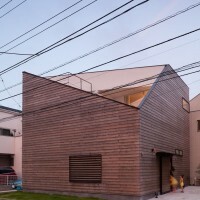 This design, which cuts away the Western corner from this extruded volume of the site, created a focal point within the house, while still enabling a connection to the surrounding exterior environment. 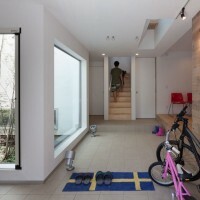 The cutaway corner is able to establish a direct view onto the small hills west of the house, as well as retaining privacy from the street below. 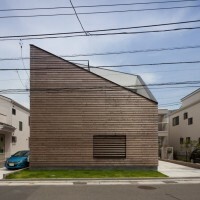 The use of natural wood material for the extruded volume itself allowed the design to incorporate a hard edge at the cutaway corner, creating a sharp and distinct separation from the rest of the design. 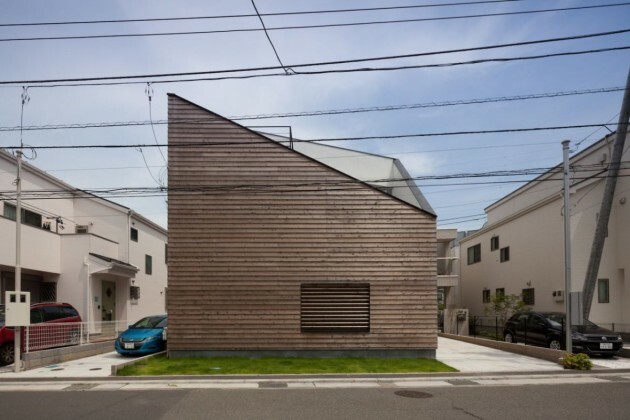 This triangular surface edge also helps to break up the solid aspect of the design and somewhat control its presence onto the street. 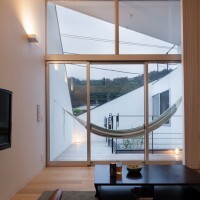 The interior planning of the first floor revolves around layers of space; the terrace, inner terrace, and then the private bedrooms, all surround the enclosed symbolic tree planted in the inner garden. 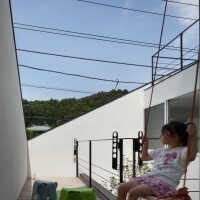 Level changes were also implemented to create different opportunities for the children’s room and its relation to the inner terrace; the floor level can also be utilized as a bench, allowing multiple uses to the open space. 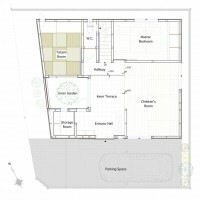 The inner terrace can also be viewed as a spacious entrance hall, which allows the extensive walls to be enjoyed as large storage areas as well. 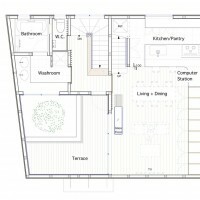 The second floor Living/Dining/Kitchen space enjoys a ceiling height of more than 3.5 meters. 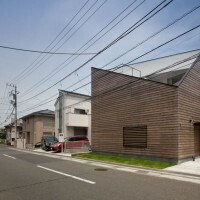 Looking towards the street you are able to view the triangular cutaway corner framing the hills beyond, as well as the symbolic tree sprouting up from the first floor. 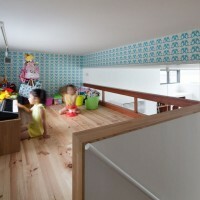 This tall ceiling brings in enough light to brighten up the Loft, creating a sunny, playful space for the children, while still being connected to the living room below. 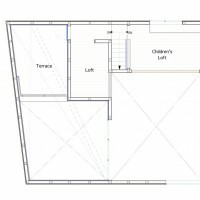 The cutaway corner of the exterior wall is adjusted so that it comes down to a height of a handrail, creating privacy at just the right level without completely enclosing the second floor outdoor terrace. 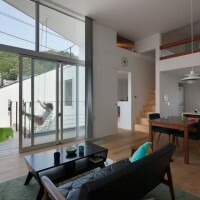 The windows placed throughout the East and South side of the house take into consideration the neighboring buildings and so are located at relatively high locations, controlling both light and the view into the home.